Chef Paul with brother and fellow Louie'n, Mark. 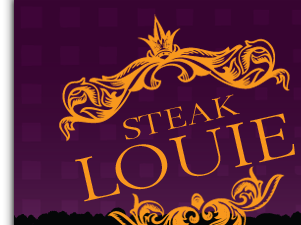 Steak Louie is Chef Paul Listenberger’s creation. Chef Paul, a St. Louis native, received his formal training through St. Louis Community College’s culinary program. He apprenticed as a saucier at local establishments where he moved quickly through the kitchen ranks. In ‘92, he became the executive chef responsible for all Johns Hopkins School of Medicine kitchens. It was his East Coast experiences that inspired the Steak Louie sandwich. Chef Paul has fused St. Louis flavors into the ordinary cheesesteak. Choice cuts of chicken, regionally grown, grass-fed beef, local fresh hoagie bun, spices and Hill inspired sauces is what makes a Steak Louie an unforgettable River City experience.